Hayes is on pace to smash the school's season record for shooting percentage. Will Hayes jump into the NBA draft this spring? It's too early to tell. 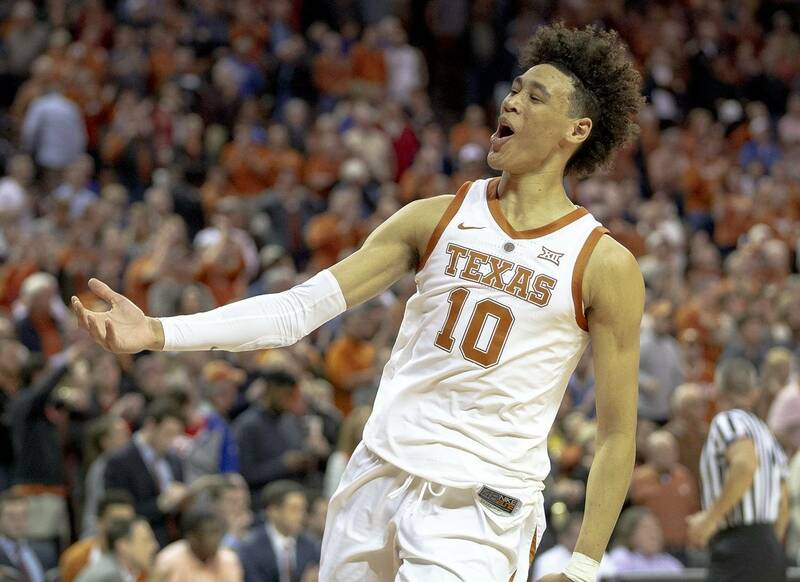 The random sequence of life events that brought Jaxson Hayes to Texas is every bit as impressive as his soaring alley-oop dunks. Start in 1995. Kristi Kinne was the star of the Drake women’s basketball team. She was easily one of the best in Iowa history. The biology major took 18 credit hours in the spring semester and still led Drake to a conference title and the NCAA Women’s Tournament. But late in the season, the 22-year-old felt something wrong. News of her ovarian cancer eventually leaked, and the ensuing nine-week chemotherapy treatment made front page headlines all over the Midwest. When Kristi went in for surgery, her mother, the late Vicky Kinne, had some sage advice. Give doctors permission to remove one ovary. “I’d get a second opinion before they take everything,’” Vicky Kinne told her daughter. Sure enough, doctors couldn’t get a clear scan. A few years later, Kristi had gotten into coaching and was in an Iowa City restaurant waiting on a recruit. The Fieldhouse, a well-known local bar, puts up photos of every All-American that played for the Iowa Hawkeyes. Pass the ketchup, and would you look at that? “She happened to sit down in a booth where my picture was,” recalled Jonathan Hayes said, a first-team All-American tight end in 1984. He’s had health issues, too. Hayes’ diabetes, first diagnosed while he was in college, hasn’t slowed him down one bit. 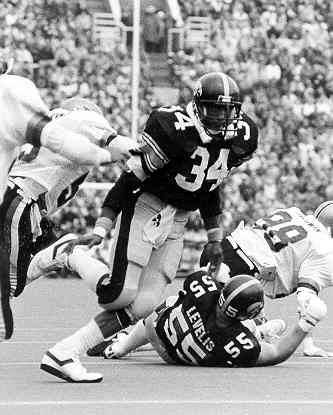 He was a second-round pick in 1985 of the Kansas City Chiefs, logged 184 career games from 1985 through 1996 and played in the Super Bowl with Pittsburgh. Kristi and Jonathan had actually met briefly years before. What’s he doing now, she wondered. Kristi went home, found an old phone bill and called him up. Jonathan rang back 20 minutes later. “We’re dating, and I was praying for a sign,” Kristi said. “Oh my goodness, this is too good to be true, right?” When Kristi took Jonathan around to meet family and friends, they were awestruck. She’s dating Jonathan Hayes! “He had been the grand marshal of the parade in my hometown when he was a senior in college,” Kristi said. The two were married in 1999 and the couple landed in Norman, Okla. Jonathan Hayes joined the Oklahoma coaching staff headed by an old Iowa teammate, Bob Stoops. The newly-named Kristi Hayes joined OU women’s basketball coach Sherri Coale’s staff. Jaxson Reed Hayes was born smack dab in a Sooners hospital on May 23, 2000. With two athletically-gifted parents, Jaxson grew up in a competitive household environment. He was encouraged — OK, maybe forced — to play everything. In kindergarten, he was in gymnastics and, yes, even took ballet. Later, it was baseball, lacrosse and even taekwondo. The Hayes family moved to Cincinnati when Jonathan landed on Marvin Lewis’ staff with the Cincinnati Bengals in 2003. That’s where they’ve been for the last 16 years. The family has grown a bit, as Jaxson now has a younger sister Jillian — a possible collegiate athlete herself — and two younger brothers, Jewett and Jonah. Somewhere, Vicky Kinne nods in approval. Jaxson would travel with his dad to Bengals training camp at Georgetown College in Kentucky. He’d spend late July and August as one of the team’s ballboys. It’s amazing what you learn at an NFL training camp. You learn what to do, “and what not to do,” Jaxson said. His own athletic career started slowly. Hayes was a 6-foot-tall high school freshman who couldn’t even start for the B-level basketball team. At least he could jump. As a 6-4 sophomore, he played tight end for the football team and basketball. The football coaches, for whatever reason, wouldn’t play him all that much despite his soft hands and growing athleticism. Jaxson ultimately dropped back down to the junior varsity team just so he could play. When the season was over, he made up his mind. He was going to focus solely on basketball. Things started looking up literally and figuratively his junior year when Jaxson was now 6-7. College recruiters couldn’t ignore the fluid athlete playing for Twenty-Two Vision on the AAU circuit. Texas coach Shaka Smart dispatched assistant Darrin Horn to scout him in a tournament in South Carolina. “I literally watched him run up and down a few times and knew on just sheer movement alone, man, this kid could be really good,” Horn said. An athlete who still had never started a high school varsity game was suddenly on college basketball’s most wanted list. The first school in line, Middle Tennessee State, offered Hayes just off his highlight video alone. A few months later, Hayes had 42 scholarship offers. Smart called to offer a scholarship when the family was chilling at Starbucks waiting on Jaxson’s next AAU game. “Our family always goes to Starbucks for breakfast,” Jaxson said, “because we like their sandwiches there.” Now, he likes them even more. Having produced two first-round draft picks in Jarrett Allen and Mo Bamba sure helps. Hayes wound up 102nd on the national recruiting lists, according to 247Sports, and was considered the fifth-best prospect in Ohio. Hayes finally got his first varsity start as a 6-10 senior as Cincinnati Moeller went on to win a state title. He averaged 12 points, seven rebounds and four blocks. Hayes didn’t start initially at Texas, either. But the now 6-11 big man quickly became known as a dunk machine. He went 5-for-5 shooting against North Carolina, 6-for-6 against Purdue and 6-for-6 against Providence. The guards throw it up and Hayes hammers it home. Smart finally inserted him into the starting lineup just before the start of Big 12 play. He’s started ever since and fell one rebound shy of his first double-double in Tuesday night’s win over Kansas. Going into Saturday’s game at No. 20 Iowa State, Hayes is shooting 73.7 percent — a figure that will smash the UT season record if it holds. Dexter Pittman shot 65.4 percent during the 2009-10 campaign. Hayes is averaging 10.6 points per game. Granted, most of Hayes’ shots, like Pittman’s were that year, are dunks via lob passes or layups. He still needs work on an overall low-post game. But he also has 55 blocks and averages 5.2 rebounds per game. Against Kansas, ESPN announcers were amazed at Hayes’ hands. His hand length, measured from the crease in your wrist to the top of the middle finger, is nine-and-a-quarter inches. Hayes’ hand width, measured from the thumb to the pinkie finger, is 10-and-three-fourths inches. Those are awfully big mitts. He wears a shoe size 16. And pro scouts are likely salivating at the fact that he may not be done growing. Yeah, so about the NBA. Um, well, that’s an interesting topic around Cooley Pavilion. A player many thought would be a foundational piece for the Horns now might be a one-and-done talent off to the NBA this year. At this point, the Hayes family isn’t ready to talk about the NBA draft, much less think about it. Given the upward trajectory of Jaxson’s career up to this point, is there any doubt he’s going higher? “What’s really refreshing about him is that he’s still a kid,” Horn said. Like just the other day, the big men were the ones throwing lob passes in practice.